It is a chemical that appears as a yellow or colorless liquid and has an unpleasant odor. It is classified under the category of volatile organic compounds. CAS Identification Number – The CAS Identification number of this compound is 107-02-8. 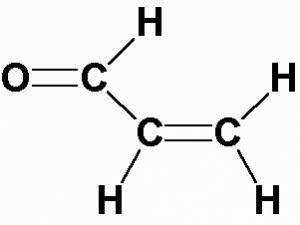 IUPAC Name – The IUPAC Name of this substance is Prop-2-enal. Molecular Formula – The molecular formula of this substance is C3H4O. This substance exists naturally in some pesticides and livestock feeds. It is also produced due to atmospheric reactions of 1,3-butadiene. The substance is industrially prepared by oxidation of Propene. This helps produce several million tons of Acrolein on a yearly basis. Heating glycerol to 280 °C makes it decompose into Acrolein. It is also possible to produce this compound on a lab scale by the chemical reaction of Potassium Bisulfate and Glycerol (Glycerine). Small amounts of this chemical can naturally be formed in the environment due to the decomposition of some pollutants in external air on combustion of tobacco or gasoline. It is also formed when pyrolyzed vegetable and animal fats are burnt. A natural byproduct of fires, it is one of various acute toxicants that firefighters have to endure. In words, it can be represented as H2C = CHCHO. Read on to know all about the physical as well as the chemical properties of this chemical. The substance has a density of 0.843 g/cm3 at 20°C. The chemical is found to boil at a temperature of 53°C. The compound melts at a temperature of -88°C. The substance has a vapor pressure of 210 mm Hg at 20°C. The chemical has an odor threshold of 160 ppb (370 mg/m3). It is soluble in ethanol as well as diethyl ether. It is also soluble in 2-3 parts of water. The chemical has a specific gravity of 0.8621 at 0°C. The flashpoint of this compound is found to be less than -18°C by the Open Cup Method. It is an unstable compound which is stabilized with Hydroquine. It may form unstable peroxides over a period of time. It is reactive with acids, alkalis and oxidizing agents. The substance polymerizes to form a plastic solid known as Disacryl in the presence of bright light, strong acid or alkali. The auto-ignition temperature of this compound is 233°C. The molecular weight of this substance is 56.06 g/mole. Its color varies from transparent to light yellow. The pH value of this chemical is 7 (Neutral) in 1% soln/water. The compound is miscible with benzene, ketones and lower alcohols. It is mainly used as a chemical intermediate in the manufacture of acrylic acid as well as its esters. This compound is normally used to make pesticides and other chemicals. It is also used an algicide and aquatic herbicide in irrigation canals. It is used in oil wells as a microbiocide. It is used in the production of perfumes and plastics. This substance is used to make colloidal forms of metals. The chemical is used as a slimicide in manufacturing paper. Due to its pungent odor, it is used in methyl chloride refrigerant as a warning agent. The material has been used in poisonous gas mixtures for military purposes. It is also used in water treatment ponds, liquid hydrocarbon fuels and cooling-water towers. Read on to know all about the Material Safety Data Sheet (MSDS) for Acrolein. Exposure to this chemical can give rise to toxic consequences for a person. Know how this substance affects the different parts of the body. The skin can suffer burn injuries on contact with this substance. It can have corrosive effects on the skin surface. There can be itchiness and redness of the skin with blisters and scales developing over the surface. Exposure to spray mist or liquid form of this chemical can damage the mucus membranes of the eyes as well as the mouth. The eyes can suffer from redness, inflammation, itching and watering. Accidental inhalation of the spray mist or liquid of this chemical can produce acute irritation in the respiratory tract and even lead to its damage. An affected individual may suffer from choking, coughing and shortness of breath. It is an acute pulmonary irritant. Accidental ingestion of this compound can be extremely damaging for health. The mucus membranes of the mouth can suffer inflammation and irritation and suffer damage. The substance can have chronic health effects on human beings. This may result in health hazards such as damage to vital organs like eyes, skin, lungs and the upper respiratory tract. The following safety measures should be followed in case of accidental exposure to this substance. In case of accidental skin contact with this chemical, contaminated clothes and shoes should at once be removed. The affected area should immediately be cleaned with a disinfectant soap and flushed under cold, running water for at least 15 minutes. An antibacterial cream or emollient should be used to cover the affected skin region. If irritation and redness fail to subside, medical attention should immediately be sought. Contaminated shoes and clothes should be cleaned and washed thoroughly before reuse. In case of accidental exposure of eyes to this chemical, any contact lenses should be removed as soon as possible. Eyes should be flushed with enough water for at least 15 minutes, keeping the lids open. It is always better to use cold water for cleaning. Victims of accidental inhalation should immediately be transferred to a fresh, airy region. If breathing is difficult, medical attention should be sought and artificial respiration should be provided. People who accidentally consume this material should not be forced to vomit unless instructed by a physician. Such people should not take anything by mouth. Their clothes and accessories such as shoes, ties and belts should be loosened. Medical attention should immediately be sought for such individuals. The substance should be stored in cool, well-ventilated and isolated areas. It should be kept in tightly sealed and closed containers away from all possible sources of ignition. Acrolein storage should not be done at above 8°C. A variety of this chemical is available for various industrial purposes. Buyers should always purchase the best quality of Acrolein that also suits the need and budget of their business.